Ahhhh…getting dressed! It is a wonder every day that I get to put on jeans and wear my favorite things again. 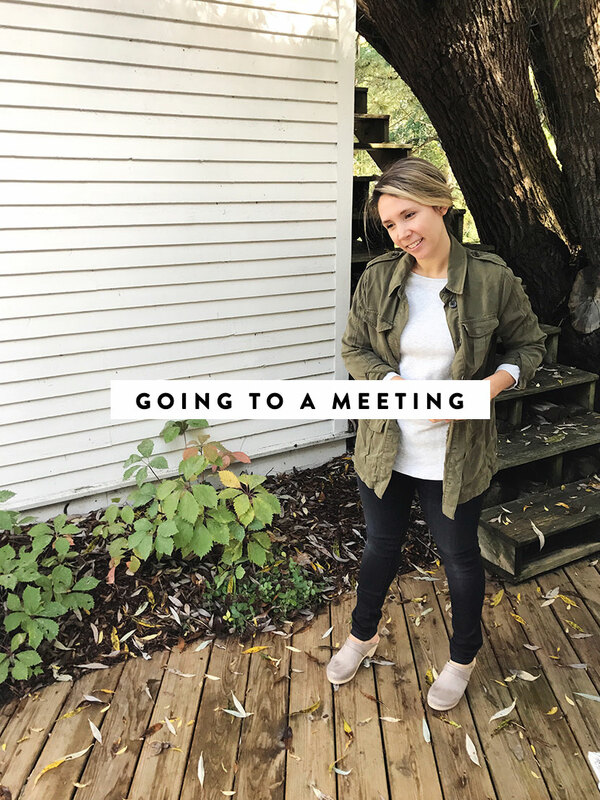 I have been meaning to write a post specifically about working through the postpartum body from my experience, but till then…know that just in the last month and a half I have been back to most of my old clothes. In honor of that, I am so excited to start doing more style stories again. 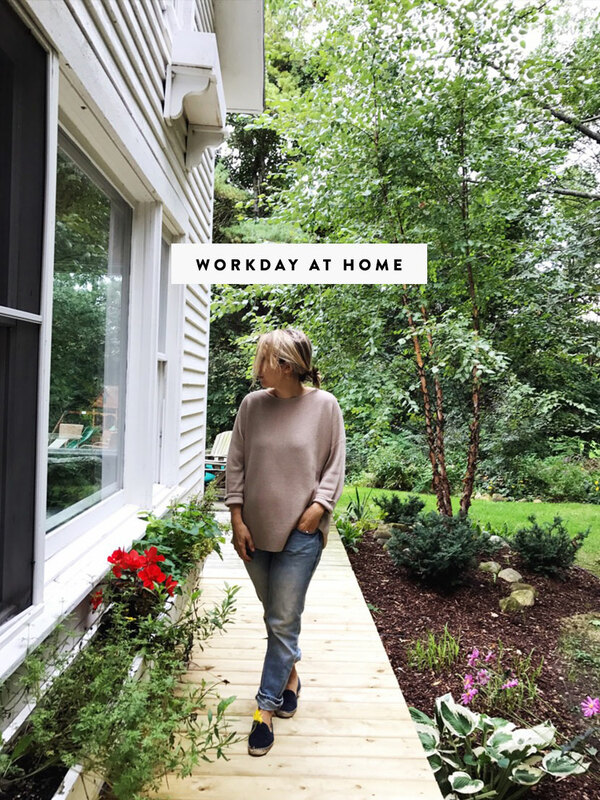 I thought a fun challenge for myself was to share what I was wearing every day both because I know many of you have asked me what I wear while nursing and also what my day-to-day style is like so I felt this would be fun. Let me know your thoughts. I plan to keep up other style posts, but for a while I thought I would share my looks from all 7 days of the week for you along with links and suggestions for similar items if you are interested. Let’s dive in. 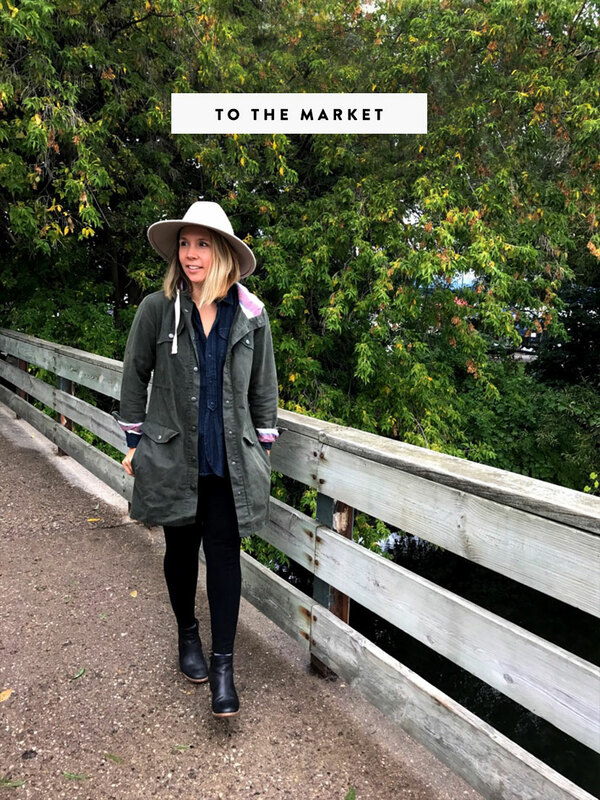 I love the farmer’s market on the weekends and this weekend it was rainy so I pulled out my FAVORITE jacket and boots for the occasion. I love that I get to wear layers again after living in a warm damp climate it feels good to be back to my roots and things that feel comfortable to me. When I am home and working, I am balancing Hayes between Mike and I and our work. It is complicated, but we are making it work enjoying time with him and getting work done. But sometimes it results in comfier attire so I rely on my favorite slip-ons, comfy boy jeans, and an oversized sweater. Oh and the messy bun even with my new cropped hair is so fun. Monday was a warm day here so I was lucky to get to pull out a couple items I have loved this summer. I also found out my favorite jeans fit me again so that was a huge win. I love this top that is on sale from Loft right now. It is flowy and easy to wear either over a dress or with jeans. My favorite place in town to stop is are the Warehouse Market. We are friends with many people who own places here so it is fun to say hi and support their companies that they love so much. #1 on that list is Blk Mrkt where I am currently obsessed with the iced Matcha with Almond Milk. Favorite mid-day pick-me-up for sure. For that quick stop I wore a couple simple and favorite pieces in my closet. My HDH Basic top is just that a basic in my closet especially as a nursing mom. It is easy to wear and maneuver. Also, it cleans up well. Then these clogs from Hanna Andersson are just making my life this week. They are the best fall shoe! This is basically what I call my everyday outfit. All these pieces are staples in my closet and are super comfy. These shoes, for instance, have been long-standing favorites for a year now and I love whenever I get to wear them. When I day calls for pumping out the final touches on posts I keep it simple and this is pretty much my alternative to wearing leggings all day. Yesterday we had some meetings here via phone, which I still get dressed for even if we aren’t going anywhere because I like the practice. 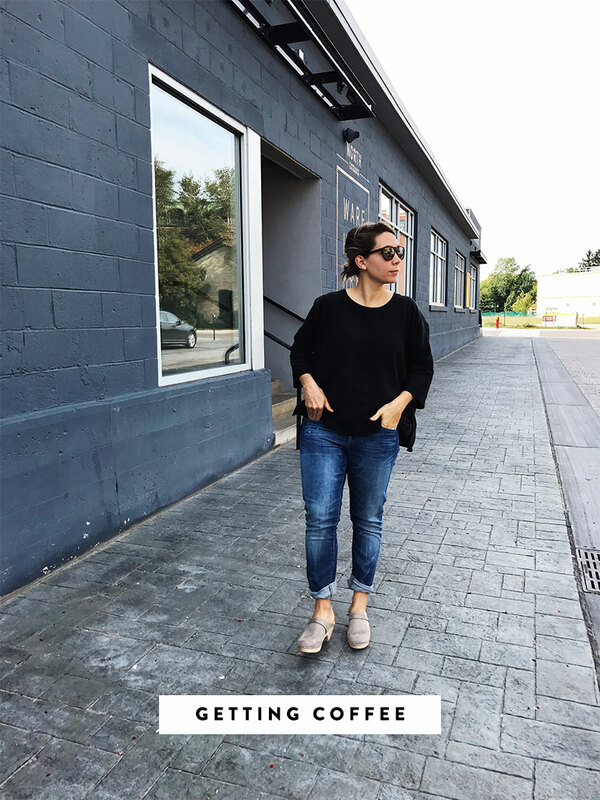 I rocked my jeans the second day in a row with some great simple pieces….oh and those clogs again from Hanna Andersson. As a fashionably challenged male, I wouldn’t mind seeing a series of posts like this by Mike as well. Also, keep up the YouTube videos. Thanks you two. I love your new hair cut! …and you just radiate such happiness in all these pics too! Awww thanks! I am loving it too! I needed to freshen up! And we are loving life here. It feels good to be home. 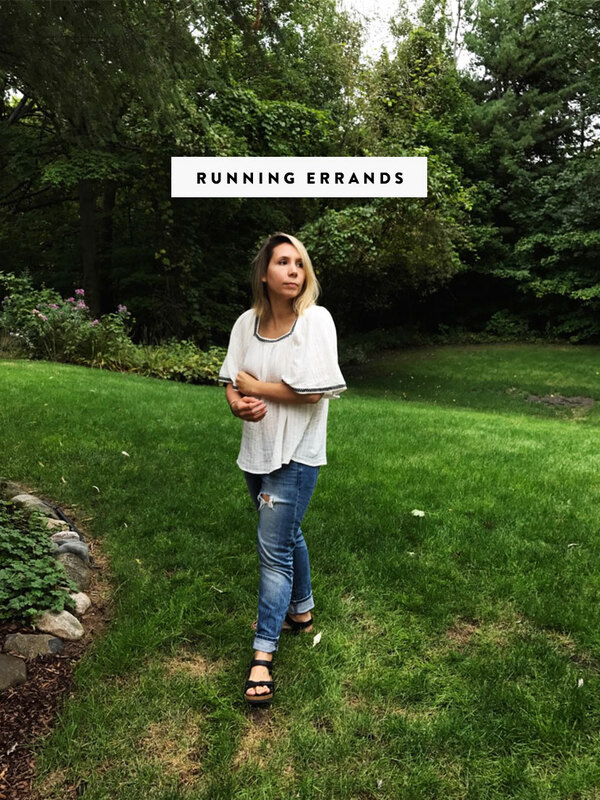 Love your running errands outfit! Love that Old navy Shirt. I have it in the mustard color, but That gray is a must-have, too! And those madewell boots. ? Serious heart eyes. Also, i know all about dressing for that nursing/postpartum life. You’re rocking it! Can’t wait to see more of these posts–love your style. Yes that shirt is amazing and soooo soft! I don’t want to take it off! And thanks! Also, no idea what happened with the capitalization Back there. ? I love this new post of showing your outfits! You have such an easy, down to earth style. 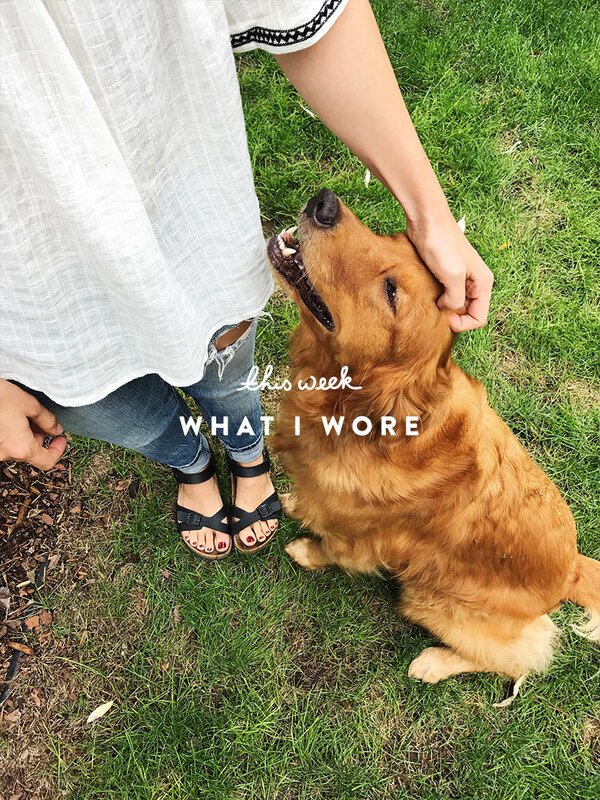 I love seeing what you wear! 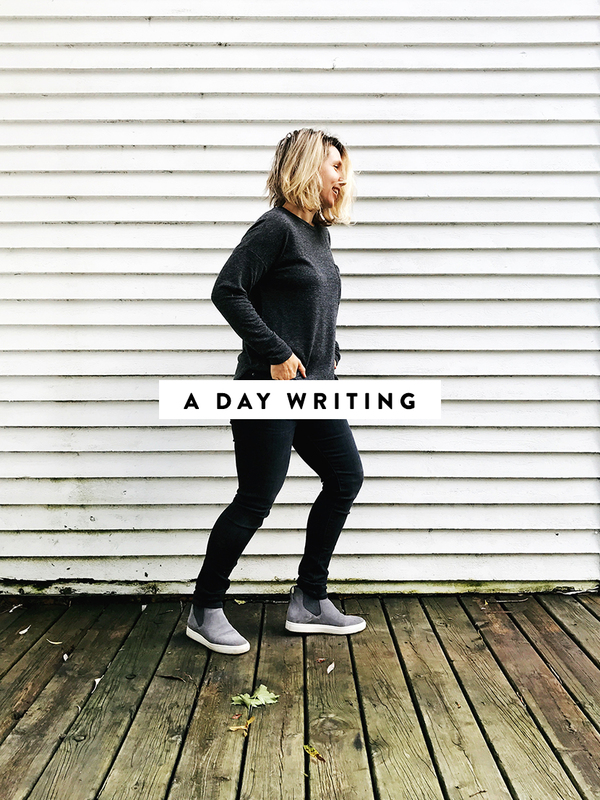 your day of writing outfit speaks to my soul-those shoes are insane!! I’m in love with all of these! My favorite are the first two. I also really love the jeans you wore for errands! So cute! I’m DEFINITELY inspired by your wardrobe. 🙂 Have you ever thought about doing a capsule wardrobe? I’ve been looking more into them recently. Hi! Just wAnted to tell you that I love your style and I am so glad that you have moved tO an area that has a similar climate to where I live. I’M in northern ontario and now i can get year round style insPiration! YEAH! So glad you love the post! We have another one coming up on Friday! You look cute in all of these! Being a neW mom this year too i love how these outfits aRe coMfy to run after a babe, yet you can feel put together. Yes, i vote for more “what you wear” posts. Great inspiratIon! Thanks!